For a variety of reasons I’ve never cared much for the month of November. But rather than go into that, I enclose a piece from my travel archives about a city that we all know and love, with the exception of the Prince of Darkness. Although I am no more credulous about the existence of the devils than I am about the guardian angels that putatively do battle with them for the prize of our immortal souls, others do, and I must admit that blaming things on the Devil does spice things up a bit. And much of the world, particularly that part fascinated and infatuated with astonishing achievements of the Renaissance, comes to visit this spiritual hometown. Yet few of those who walk its history-laden streets and museum galleries have much, if any, memory of the flood which severely damaged many of the cultural treasures of Florence, and destroyed many others. In the summer, when most of the visitors arrive, the Arno typically flows low and placidly beneath the city’s bridges, its banks so lofty as to defy imagining that they could ever be breached. Yet the events of November 3 and 4 of 1966 caught the Florentines by almost complete surprise. November has always been the wettest month in Tuscany, and it was already raining hard as the local troops were preparing for the Armed Forces celebration on the following day. On the night of the 3rd the cinemas and cafes were crowded. By midnight the mayor, the chief of the Carabinieri, and nearly the entire population was asleep. In the next three hours the waters rose with incredible swiftness. Cellars were already flooded in the low-lying Santa Croce and San Frediano quarters, and the city drains were quickly overtaxed. Powerful jets of water mixed with oil from storage tanks that had burst were gushing from the city’s manholes. By 3:00 a.m. electrical failures began that would soon plunge the entire city into darkness. Still, by 4:00 a.m. most of the Florentines slumbered when a mass of water was discharged by the Valdarno dams, adding to and accelerating the deluge. The force of the river’s waters, risen now to less than a meter below the arches of the Ponte Vecchio, tore away huge chunks of the embankment. Astonishingly, the vast majority of the city’s inhabitants were still unaware of the disaster overtaking the city. By 7:30 a.m. a vast lake was spreading over much of Florence. Torrents of water, trees and other debris smashed into the shops on the Ponte Vecchio, carrying away gold jewelry and gems from its shops. All electrical power was lost, thousands of houses were flooded, none of the bridges were passable, and nearly every road leading from the city was blocked by the waters. Florence was isolated. Still, the waters continued to rise. By 10:00 a.m. most of the historic center of the city resembled Venice. The people, at last aware of the catastrophe befalling their beloved city, were helpless to do little more than try to save themselves. Some were trapped in the upper stories of buildings, some on the roofs, others made their way to the higher ground on the south side of the river. Several had already drowned. At its peak on the day of November 4th the waters reached a height of over 20 feet in some areas. Nearly every major historic building had been flooded: the Uffizi, the Palazzo Vecchio, the Cathedral and Baptistry, the churches of Santa Croce, Santa Spiritu, Santa Maria Novella, and all the palaces of the great Florentine bankers, save for the Pitti. When the water began to subside later in the day it slowly revealed the 600,000 tons of mud, filth and rubble in the streets and buildings. Fifteen thousand automobiles were destroyed, 6,000 shops were out of business, 5,000 families homeless. Great as those losses were, they were at least replaceable; the city’s artistic treasure was another matter. The city’s enormous endowment of precious Renaissance architecture, painting, sculpture, and books and manuscripts were the essence of its people’s pride, identity, religious and intellectual traditions, and, just as importantly, its present and future economic life. As soon as the receding waters would permit the Florentines rushed anxiously to the churches, museums and libraries that were the mind, spirit, and lifeblood of Florence. The best estimates accounted that over 1,400 works had been damaged by the surging water, or the mud, oil and debris that it carried. Of these, 850 were seriously affected, requiring immediate attention if they were not to be lost altogether: 635 paintings on wood or canvas, 81 frescos and cycles of frescos, 14 groups of sculptures, 144 individual sculptures, and 22 illuminated manuscripts. Among the damaged were some of the most important in Renaissance art. Cimabue’s “Crucifixion,” the huge painted crucifix considered to be among the first works which represented the transition from the art of the Middle Ages to that of the Renaissance, was battered by waters which surged through the church of Santa Croce at a height of 20 feet; much of its pigment had flaked off and been swept away. Important groups of frescos by Uccello, in Santa Maria Novella, and by Botticelli, in the Ognissanti Church, in addition to frescos by Martini, Veneziano, and Lorenzetti were severely affected by oil and water. At the very heart of the city five panels of gilded Ghiberti Doors on the Baptistry were dislodged and battered; only their gold and bronze weight kept them from being carried away. Hundreds of musical instruments at the Museo Bardini, arms and armor in the Bargello, and Etruscan artifacts in the Museo Archeologico were also damaged. Over 200,000 books and manuscripts from the National Library were lost forever, as were 130,000 photo negatives of the Uffizi’s collection of Renaissance painting, although, miraculously, none of its paintings were lost. 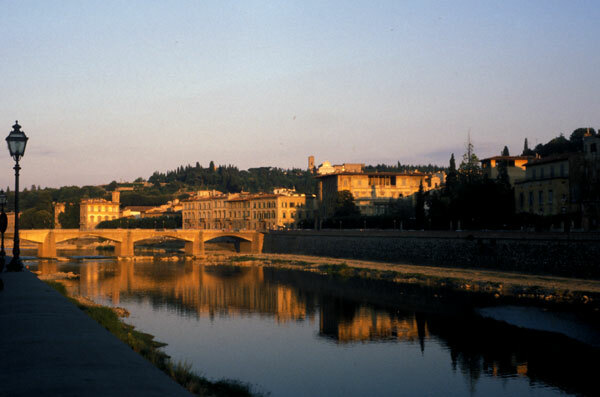 While the people of Florence dug their homes, shops and automobiles from the mud and began putting their contemporary lives back together, the city’s curators and art restorers, supplemented by volunteers from around the world, set about with all the ingenuity and financial assistance they could muster to salvage the treasures of the city’s golden age. Owing to their efforts today’s visitor to Florence must search hard to find the effects to the worst flood in the city’s history. Here and there, on the corner of a building one may come upon etched dates and high water marks; that of November 4, 1966, the highest. Few, if any of these visitors will be around in the year 2066, when, meteorologists forewarn, November may bring an inundation of equal or worse magnitude to this illustrious city. Most of the visitors will tread the museums, churches and libraries, unmindful of the flood that imperiled treasures in them, unaware of the restorers’ skill and diligence they witness along with the brilliance of the masters of the Renaissance. Eventually, these pilgrims may make their weary way to the banks of the Arno to catch a refreshing breeze and bask in the gilded light of a fading Tuscan day. Well below them the Arno will glide serenely beneath the arches of the Ponte Vecchio, waiting for the Devil to choose his next November. © 1993, James A. Clapp, “Unholy Novembers in Florence,” San Diego American Planning Association Journal, September 1993. Posted: Sat – November 8, 2003.